Learn how to complete concrete floor repairs to maintain the appearance of your basement or garage floor. The exact repairs will depend on the overall condition of the floor. A high quality garage floor paint or other appropriate finish applied after repairs are complete is also a good idea to protect the surface of the floor. Start by removing any loose material around the hole using a cold chisel or a masonry grinding disk on a drill. Prepare the sides of the hole by making the bottom slightly larger than the surface opening. Do this by beveling the edges by 15-20 degrees. Further prepare the surface of the hole by applying a concrete bonding adhesive with an old paintbrush. Now you can patch the hole using vinyl reinforced patching compound and a metal trowel. The key to getting a good patch is applying the patching compound in layers. Try to make each layer about one-fourth of an inch thick and allow each coat to dry at least 30 minutes before applying the next one. Allow the top of each layer to remain rough so the next layer will bond with it. The final layer should be carefully smoothed with the metal trowel. It is best to build up the layer so it is slightly higher than the surrounding concrete floor. That way you can come back with the trowel to feather the edges and better conceal the patch. The steps you must complete to repair a crack are similar to those needed for a concrete hole repair. The only difference is the prep work you must complete before beginning if the crack is particularly large. Start by removing any loose concrete with a wire brush. Use a chisel to make reverse angle cuts that ensure the bottom of the crack is slightly wider than the crack opening. Apply bonding adhesive to the interior of the crack as well as on either side of the crack. 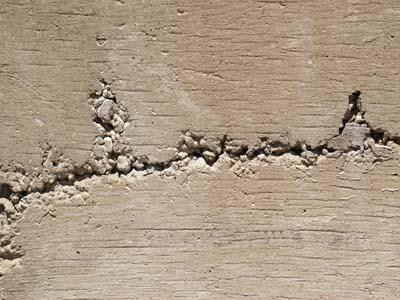 A large, deep crack should be filled with sand, leaving only 1-1/2 inches of the crack to fill with concrete. Use a trowel to fill the crack with vinyl reinforced patching compound, feathering the edges to blend the patch. Sometimes there are enough cracks or imperfections to merit resurfacing the entire floor. Although there is more prep work involved, even this concrete floor repair method is simple. Start by removing any debris or loose concrete on the floor and clean it thoroughly with water and a wire brush. Allow the floor to dry completely. Then use muriatic acid to etch the concrete. Muriatic acid can be found in any Home Depot or Ace Hardware and the specific dilution required will vary depending on the manufacturer's recommendations. Be sure to wear gloves and follow all safety instructions when working with muriatic acid. When the muriatic acid has been left on the required length of time, rinse the concrete floor thoroughly. Let the floor dry until it is damp, not wet. Now, using a paint roller, apply a concrete bonding adhesive to the floor. You may want to work in sections to complete the resurfacing from this step forward, depending on the size of your floor. Allow the concrete bonding adhesive to dry until tacky to the touch. Next, apply the resurfacer with a metal trowel. The best resurfacers contain latex that acts as a bonding ingredient. Mix the resurfacer according the to manufacturer's instructions. If you are working in sections, mix only enough to cover the section on which you are working. Smooth it as best as you can with the metal trowel. Then use a rubber float to smooth the concrete further. Sometimes water pools onto the concrete if you have been working for a while. Finish any work you are doing on that section as quickly as possible should this occur. Continue working in this manner until your entire floor has been resurfaced. If you are working in sections, be sure to feather the edges carefully together to avoid any seams. If you are working on a floor that has control joints present, be sure to remark them into the surface of the concrete with a dowel as you work. Working with concrete is often difficult for the first timer. Many people forget that concrete does not dry; the cement creates a chemical reaction that causes the material to harden. This is essential to keep in mind so that you can remove any excess concrete from your tools. It is also important to work efficiently, yet slowly enough so you can generate the finish you desire. If you are considering resurfacing your floor, consider doing some smaller concrete projects to gain the confidence and skill to complete a larger project.